A Tailwind CSS preset for Laravel. This is a Laravel front-end preset for Tailwind CSS/Vue.js. This preset will replace the default Bootstrap scaffolding, including the example Vue.js component. It will also compile the assets using Laravel Mix and PurgeCSS in order to generate the smallest files possible and add PHP CS Fixer and ESLint/Prettier configurations. Warning: Installing this preset will overwrite your existing views and assets, and should only be installed on a fresh instance of Laravel. Please use with caution. To install this preset, you must first require the composer dependency in your application. Laravel will automatically register the service provider for you. Now, install either the tailwind or the tailwind-auth preset. 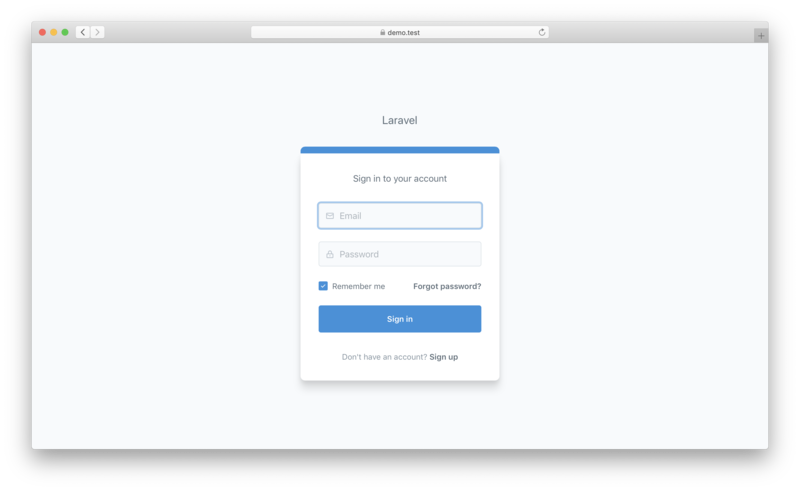 The tailwind-auth preset includes the authentication scaffolding normally generated when php artisan make:auth is executed. Note: If you install the tailwind-auth preset on a version of Laravel that is older than 5.7, you may delete the views/auth/verify.blade.php file, as it will not be used. Install the NPM packages using your favorite package manager. Now you can compile the assets using any of the Laravel build scripts (dev, prod, watch). Ensure that your database is properly configured and migrated, and you're done! At this point, you may remove the composer dependency, as it is no longer needed.